The Stampriet Transboundary Aquifer System (STAS) is the only permanent and dependable water resource for the local population living in an area that covers 87,000 sq. kmkm2 from Central Namibia into Western Botswana and South Africa’s Northern Cape Province. Understanding and managing this precious groundwater resource sustainably is essential to achieving water security in the area, and thus, improving the quality of life of neighboring and resident communities. 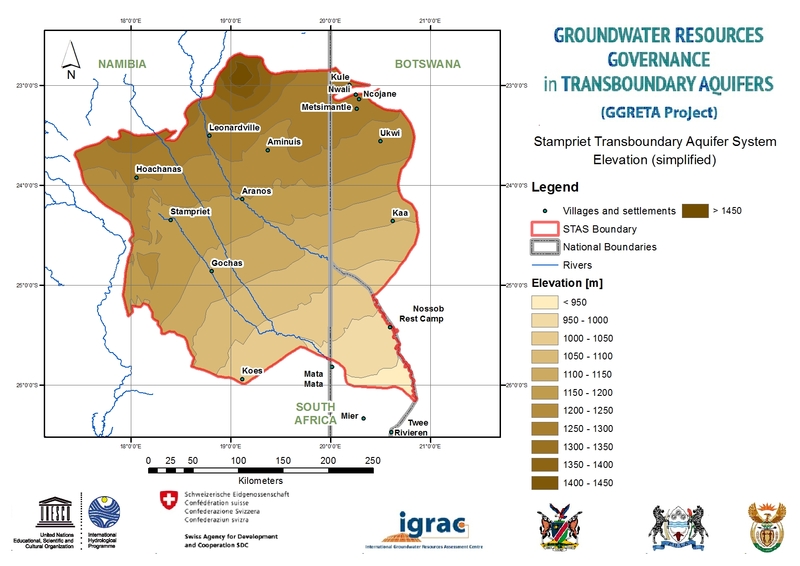 With this in mind, the Governments of Botswana, Namibia and South Africa, jointly with the UNESCO’s International Hydrological Programme (UNESCO-IHP), started an in-depth multi-disciplinary assessment of the aquifer system in 2013 within the framework of the Governance of Groundwater Resources in Transboundary Aquifers (GGRETA) project funded by the Swiss Agency for Development and Cooperation (SDC). 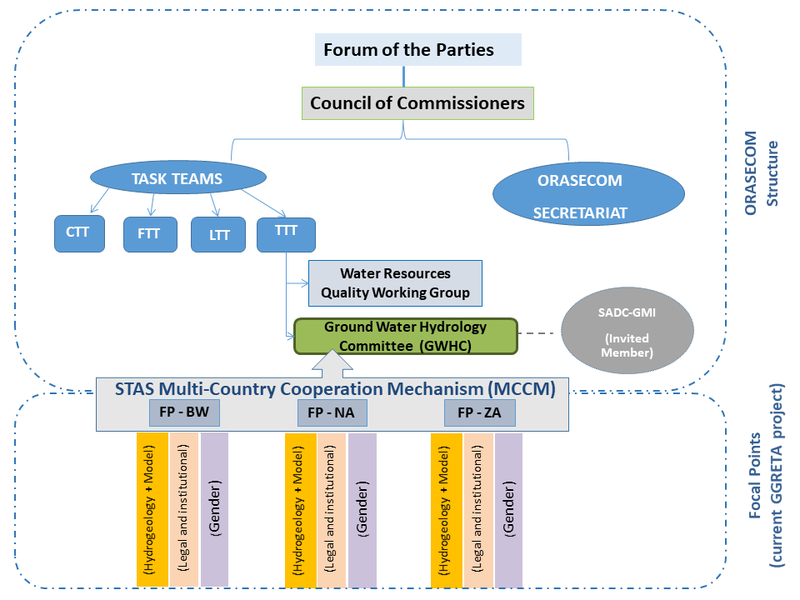 In order to consolidate the achieved technical results, these three Governments of Botswana, Namibia and South Africa decided to establish a Multi-Country Cooperation Mechanism (MCCM) for the joint governance and management of the STAS in August 2017, and nest it in ORASECOM’s Ground Water Hydrology Committee (GWHC). This is the first example of institutionalizing cooperation over a transboundary aquifer in Southern Africa. The process that led to the establishment of the STAS MCCM is a breakthrough in many aspects. First, it is the first arrangement on transboundary aquifers since the Sustainable Development Goals (SDGs) were adopted in 2016. Prior to the decision of establishing this mechanism, out of the almost 600 transboundary aquifers that have been identified, only six formal and two informal agreements had been documented worldwide. Second, it is the first operational governance mechanism to be nested in a river basin organization, thus fully capturing the IWRM approach and directly contributing to the implementation of SDG Target 6.5 both at national and transboundary level (“By 2030, implement integrated water resource management at all levels, including through transboundary cooperation as appropriate”). 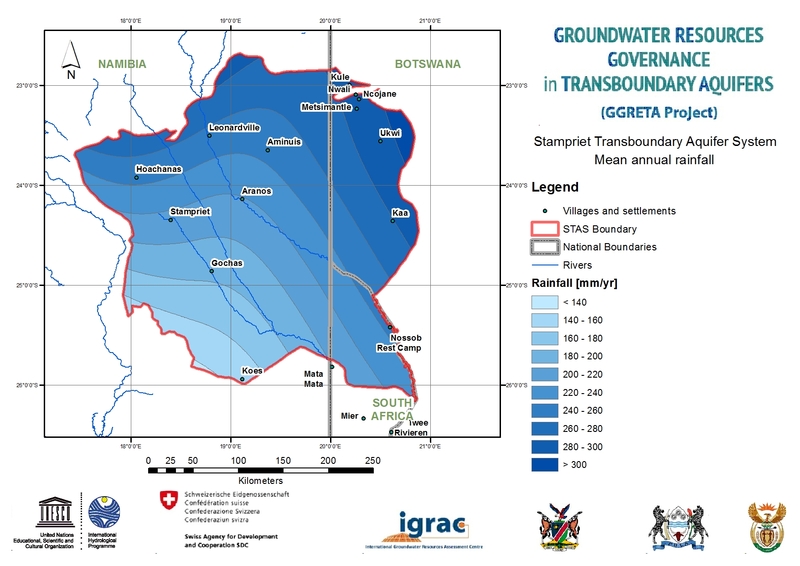 The on-going cooperation over the STAS between the Department of Water Affairs of Botswana, the Department of Water Affairs and Forestry of Namibia, and the Department of Water and Sanitation of South Africa arising from the GGRETA project, has yielded an in-depth assessment of the aquifer characteristics; including current and projected uses of groundwater, and likely future stress conditions under relevant factors. The STAS covers a large arid region stretching from Central Namibia into Western Botswana and South Africa’s Northern Cape Province (See Figure 1). It contains two confined sandstone aquifers, overlain by unconfined Kalahari aquifer units. The delineation of the STAS area follows the outer boundary of the Ecca Group of geological formations within the catchments of the Auob and Nossob Rivers. The STAS is a very large transboundary aquifer system, receiving insignificant recharge, in a dry region without permanent surface water. The STAS area is 86 647 km2 in extent and has a generally flat topography, gently sloping from NW to SE, between 1450 and 900 m above mean sea level (see Figure 2). It has a hot and dry climate, with an annual mean temperature of 19-22 °C and mean rainfall ranging from 140 mm/yr in the SW to 300 mm/yr along the northern and north-eastern segment of the STAS area (see Figure 3). During the period May through September there is hardly any rainfall. The Namibian sector of the area covers approximately two-thirds of the area and is almost completely in use as agricultural land. The Botswana sector occupies 19% and includes from North to South three distinct land use zones: agricultural land (mainly in Ghanzi district), wildlife management area and national park. The South African sector (8%) is entirely used as a national park. The area is sparsely populated with an estimated population of nearly 50 000 of which more than 90% which is in Namibia. Major settlements are Aranos and Koes, but their population is less than 5000; all other settlements have less than 2000 inhabitants. Commercial industrial and mining activities are absent. Given the climatic and other geographic features, there are no permanent rivers in the STAS area. Apart from the ephemeral Auob and Nossob Rivers that provide some water during the rainy season, there are surface water pans scattered over the area that collect and store water for livestock watering during rainy season; these reserves can last a few months after the rains. The only permanent and dependable water resource in the area is groundwater. Groundwater is withdrawn from the Kalahari, Auob and Nossob aquifers, by means of dug wells and boreholes (see Figure 4). It is estimated that at least 20 million cubic meters per year is abstracted; 66% of this volume comes from Kalahari aquifers, 33% from the Auob Aquifer and 1% from the Nossob aquifer. The breakdown of overall water use is as follows: 47% for irrigation, 37.5% for stock watering, 16% for domestic use, and 0.5% for tourism. In general, the urban centers and villages receive water from governmental and parastatal water supply corporations. Private landowners usually have their own wells. Gender surveys undertaken in October 2017 confirmed the prevalent role of women as responsible of the water quality and supply within the household boundaries (domestic use), and of men as responsible of the productive uses of water (e.g. livestock, agriculture,…). 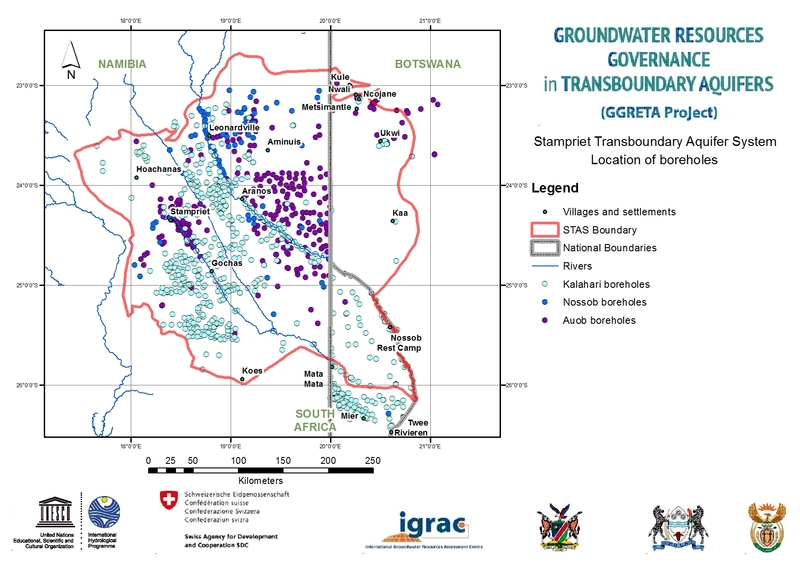 As a result of the assessment, the hydrogeological typology of the STAS can be stated as a weakly recharging three layer aquifer system (Kalahari, Auob and Nossob aquifers), characterised by low transmissivity, and low storage, primarily being utilised in Namibia for socio-economic growth, where withdrawal from storage has caused local groundwater level to decline. In the extension of the aquifers into South Africa, water quality constraints have restricted its utilisation, while in Botswana the potential for available resources is likely to be exploited, but insufficient data is available for making firm conclusions. Conceptually, the physical processes taking place in this system of two confined aquifers are reasonably understood in Namibia and not much in both Botswana and South Africa, but quantification is still limited –in spite of many efforts made over a long period of time. Apart from diffuse recharge by downward seepage from the Kalahari aquifers, there are a few recharge zones in the western part of the STAS area where sinkholes facilitate concentrated recharge during rare wet years. The mean annual recharge rate for these confined aquifer units is likely to be significantly less than that of the Kalahari aquifers, for which rates of around 1 mm/year, averaged over the area, have been estimated. The general direction of groundwater flow is from NW to SE. In the SE quadrant of the area, groundwater is presumed to seep upward from the confined aquifers and discharges into the Kalahari formations, from where it evaporates. Groundwater salinity in this zone – known under the name Salt Block – therefore is rather high. Lack of monitoring data (climate, groundwater abstraction, water levels, water quality) seriously hampers a systematic diagnostic analysis of groundwater quantity and quality stress. Groundwater quantity stress has not been observed. Lack of monitoring may be an explanation, but the exceptionally low intensity of groundwater withdrawal certainly plays a major role. If for some reasons (population growth, economic development, water transfer, etc…) the demand for water in the region would increase significantly, then very soon the groundwater resources may run short of meeting these demands. Therefore it is very important to initiate effective control of groundwater quantity, e.g. by some initial practical steps such as solving the problem of water spillage by leaking boreholes in the Auob aquifer and preventing future problems by improved regulation of drilling. Groundwater quality has its natural variations. Most notable are generally poor conditions in or near the Salt Block zone. Pollution, however, may also lead to groundwater quality degradation elsewhere in the area. The confined transboundary aquifers have very low vulnerability to pollution, but they will experience higher withdrawal pressures if overlying Kalahari aquifers become polluted. The shallower and usually phreatic Kalahari aquifers are vulnerable to pollution; in particular in the Namibian sector the pollution risk is often medium to high due to irrigated agriculture (using fertilizers and pesticides) and environmentally unfriendly sanitation and waste disposal practices. Partly from the groundwater management point of view and partly for health reasons, there is scope for enhancing water supplies and even more for improving sanitation in the entire area. Given the fragility of the aquifer system and the fact that groundwater is the only permanent source of water in this huge area, it is evident that the STAS should be governed and managed wisely. A large part of the provisions and interventions to be considered are of a local nature, but transboundary cooperation will be very useful by sharing information, exchanging experience and by harmonizing interventions across the international boundaries. At the level of the assessment, the three countries have already proven to be willing and capable to cooperate effectively. Botswana, Namibia and South Africa all possess individually the main elements of a domestic legal framework that provides essential controls on groundwater use and pollution. However, the implementation and enforcement of groundwater quantity and quality regulations raise more challenges. The STAS includes large areas where water abstraction and pollution is not subject to regular inspection and controls. In view of the importance of the aquifer resources to the future of the local population, the three countries sharing the aquifer concurred in 2016 on the willingness of establishing a Multi-Country Cooperation Mechanism (MCCM) for the governance and management of the STAS. On 17-18 May 2017, Members of the Botswana, Namibia and South Africa Delegation attending the 3rd Orange-Senqu River Commission (ORASECOM) Ground Water Hydrology Committee (GWHC) and the Technical Task Team (TTT), supported the proposal to establish the STAS MCCM within the ORASECOM structure. This proposal was discussed at the 34th Ordinary meeting of the ORASECOM Council meeting (17-18 August 2017, Windhoek, Namibia) which resolved that the STAS MCCM be nested/housed within the ORASECOM GWHC. The Ordinary meeting of the ORASECOM Forum of the Parties (Ministers responsible for water), held on 16 November 2017 in Kasane, Botswana, endorsed the resolution of the Council and approved milestones and schedule for the nesting. The process that led to the establishment of the STAS joint governance mechanism is a breakthrough in many aspects. First, it is the first arrangement for the governance of a transboundary aquifer since the adoption of the Sustainable Development Goals (SDGs) in 2016. Prior to the ORASECOM’s decision of establishing this mechanism, only six formal and two informal agreements were documented worldwide. 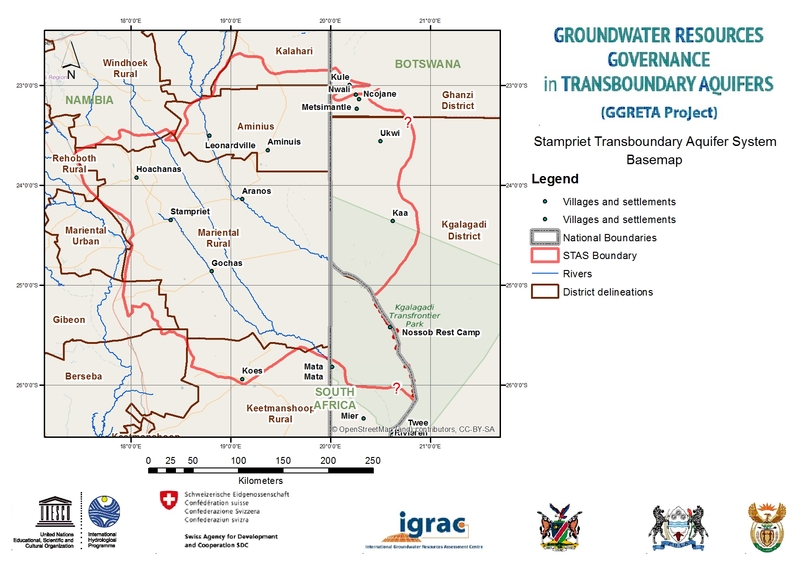 Second, it is the first operational governance mechanism to be nested in a river basin organization, thus fully capturing the IWRM approach (in particular the conjunctive management of groundwater and surface water) and directly contributing to the implementation of Target 6.5 both at national and transboundary level. Third, the mechanism will enable sustainable actions on the ground, as activities related to the STAS are part of ORASECOM’s 10-year IWRM Plan (2015-2024).